Despite the delay in rolling out the new Nutrition Facts panel, the FDA is moving full speed ahead to provide food industry manufacturers additional information they need to effectively implement the updated version of the label. Last month, the FDA issued new guidance on added sugars and dietary fibers and updated requirements for serving sizes to help companies make the necessary changes to their nutrition labels and meet the compliance dates. The FDA extended the compliance date from July 2018 to January 1, 2020, for manufacturers with $10 million or more in annual sales and to January 1, 2021, for smaller manufacturers to give them more time to develop new labels and reformulate products if needed. The additional guidance on added sugars centers around honey and maple syrup, sold alone or included as product ingredients, and certain presweetened cranberry products, as these foods meet the definition of added sugars; the added guidance on dietary fibers educates manufacturers on which ingredients meet the FDA's definition of fiber. The updated requirements for serving sizes more accurately represent what consumers actually eat and drink in one sitting. Some manufacturers already are in compliance with the new label requirements, as many consumers have seen the updated Nutrition Facts panels on certain food products. However, once the new version of the label is fully implemented in the food industry, the FDA plans to launch an educational campaign to teach consumers how to read and interpret it so they can determine the overall nutritional content of the foods they purchase and understand the association between their dietary choices and risk of chronic diseases, such as type 2 diabetes, obesity, heart disease, and various cancers. The FDA will educate consumers through videos, social media campaigns, and websites. I'm so excited about this campaign; personally, I'd like to watch the videos and peruse the webpages—and many of your clients will, too—because everybody could benefit from a lesson on how to read nutrition labels. Clients will be able to make better food choices that may lead to living a more healthful life. For more information about the additional guidance on added sugars, the FDA's final definition of dietary fiber, and serving sizes, visit www.fda.gov/NewsEvents/Newsroom/PressAnnouncements/ucm598808.htm. 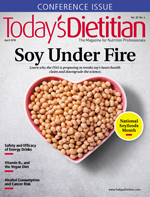 In this issue, you'll find articles on the proposal to revoke soy protein's authorized health claim, alcohol consumption and cancer risk, safety and efficacy of energy drinks, vitamin B12 sufficiency in vegan diets, and more. Please enjoy the issue!